It seems it wasn’t that long ago that we were celebrating 75 years of the Man of Steel and here we are at the 80th anniversary of his debut appearance in Action Comics #1. There must be some kind of planetary alignment going on, too. As you may have noted on the home page, the Silver Lantern itself is celebrating 20 years of existence and, this very feature, the Silver Age Sage is 18 years old! All hail the webmaster for his diligence for two decades! So, having already covered a number of my favorite Superman stories over the years, to include Superman #200 [Sage #13] and Superman #300 [Sage #35] and even Action Comics #1 [Sage #113] itself, I was struggling a bit to decide on which one to feature for this momentous occasion. I thought it should be a story from Action Comics, although I wasn’t above doing a Superman tale from any source. Finally, I settled on a 2-part tale going back to 1964 when Superman was a relative youngster of not even 30 years. Let’s take a trip in the way-back machine to check out Action Comics #311 from April of 1964 with a cover by Curt Swan, inked by Shelly Moldoff and interiors also by Swan with George Klein on inks. Editing was Mort Weisinger and “Superman, King of Earth!” was written by Leo Dorfman. The story kicks off with Clark Kent, Lois Lane and Jimmy Olsen on hand for a coronation in a “minor tropical kingdom.” The Daily Planet must have quite a travel budget. When Clark refuses to bow before the regent, royal guards seize him, but it’s all part of a bigger plan when, after being escorted across the nearby border, Clark shucks his civilian identity to deal with a situation that has arisen. 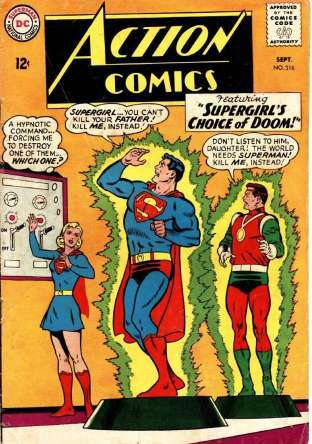 He notes that Supergirl is off with the Legion of Super-Heroes in the 30th century, so he needs to be on hand. Soon, thanks so some sophisticated equipment in the Fortress of Solitude, Superman notes that a red kryptonite meteor shower is in sector Alpha IV, but that wouldn’t be enough to trigger his instrumentation. He continues to get a reading on something threatening, but with the Red K out there, he cannot investigate. Long-time Superman readers know, of course, that red kryptonite is the variety that has unpredictable effects on Kryptonian physiology, but each chunk can only affect the Krypton native once. Our hero suddenly remembers that he’d been working on an antidote to the stuff and he’d specifically been experimenting with a piece that had once split him into two separate personages. One, an evil, fully-powered Superman, the other a non-super but good Clark Kent. Fortunately, the effects of the red kryptonite only lasted 72 hours and by the way, shame on you, Editor Weisinger. Where’s the reference to the specific story where this happened? Anyway, our hero decides to finish up his experiment on the spot, pouring some powerful acid onto the Red K and inhaling the resulting fumes with the theory that it will immunize him from all red kryptonite in the future. Well, not so much as he is shocked to be once again split in the aforementioned manner. When Clark exclaims that he cannot be affected the same way twice, the malevolent Superman retorts that this time, the split is permanent, so it’s not the identical effect. How he knows it’s permanent is anyone’s guess. The first thing the evil Superman does is put the bottle city of Kandor in blackout mode so that they cannot interfere with whatever nefarious plans are percolating in that invulnerable skull. Next, he destroys the Superman robots in the Fortress and before Kent can subdue him with the Phantom Zone projector, he crushes it and then flies Kent away from the arctic stronghold. Exposure to the cold causes Clark to lose consciousness until he finds himself aboard a Coast Guard cutter. He soon heads to the radio room to hear that Superman has called for an emergency meeting of the United Nations where he will make a special announcement. The next day, the trio from the Daily Planet are observing the U.N. meeting and to their horror, Superman demands to be made King of the Earth, at one point taking a page from Nikita Khrushchev’s playbook and banging a crimson boot on the podium when the members object. He gives them 48 hours to acquiesce. In the interim, Clark is feverishly wondering how to deal with this threat and through the American ambassador gets the Joint Chiefs of Staff together (who knew a mild-mannered reporter has this kind of clout?) and takes them to a special vault in Washington, D.C., built by Superman himself. Inside are caches of gold and green kryptonite, the gold, of course, which can stirp Kryptonians of their powers permanently and the green…oh, of course you know or you wouldn’t be reading this. After brief contemplation, the decision is made to forego using the kryptonite based on legality and the fact that while Superman seems to be going rogue, he hasn’t actually committed a crime yet. So, the voting takes place and it’s a split decision, so they tell Superman they’ll reconvene the next day for another vote. Superman uses the 24 hours to bolster his case, flying through a country in the desert and creating an ice bridge on the ocean, demonstrating his ability to cause huge upheaval. Later, another super-feat where he visits “a remote Asiatic area” and destroys a mock-up of New York City and finally making a visit to White Sands Proving Grounds in New Mexico where he personally flies a nuclear warhead into a mountain, raising a mushroom cloud and causing total destruction. What choice does the U.N. have but to bow to the will of their former champion? Superman is unanimously elected King of the Earth and he proceeds to create his marble palace and throne near Metropolis. Among his demands are that every nation forsakes their national flag and instead fly a banner with the big red “S” on it. He takes a further step in protecting his kingdom by erecting a dome and wall to deflect kryptonite bombs. In the final panels of this story, an uncharacteristically bold Clark Kent calls a meeting in the basement of the Daily Planet with Lois, Jimmy and Perry White to discuss creating an Anti-Superman Underground. They are protected from detection by the old lead press plates stored in the basement and the game is afoot. Action Comics #312 from May of 1964 had a couple of changes in the creative team with George Klein inking the Curt Swan penciled cover, and scripting for “King Superman vs. Clark Kent, Metallo!” by Robert Bernstein. 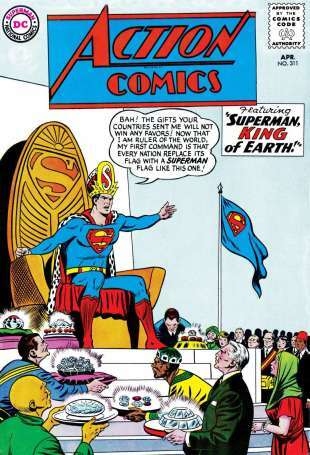 Things begin this time with King Superman announcing that there is to be no air traffic over his palace and that he has already demonstrated his ability to freeze the oceans and destroy the cities of the Earth, so no funny business. 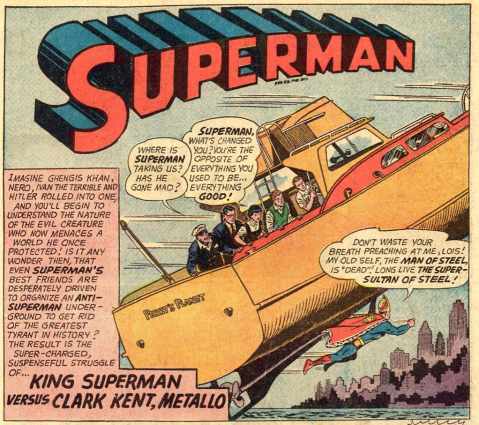 There is then a recap of how we got to where we are and then the Anti-Superman Underground has a meeting aboard Perry’s fishing boat in a deserted cove. It couldn’t be that easy, though and next thing you know, King Superman comes swooping in and hauls the boat to a sandbar, warning them that any further plotting will be dealt with more harshly. Later, Clark cooks up a new scheme, dispatching the Superman robots concealed in his apartment, but taking the costume from one of them first (don’t worry, it’s a simple metal body beneath) in case he needs it to pull off a bluff at some point. As might have been expected, the robots quickly fall to King Superman and he brings the heads back to Kent to show that he easily defeated them. Clark continues to muse about how to deal with his evil alter ego when he remembers that Supergirl has some green kryptonite squirreled away at her home in Midvale that she’d use for experimenting on how to counteract its deadly effects, but without his X-ray vision or other abilities, poor Kent is like a bull in a china shop in the house during his search and is soon discovered by the police. He quickly dons the Superman uniform he just happens to have on him and the cops assume it’s King Superman, but insist on confirming, so naturally they fire one of their service revolvers at him. The problem is that the uniform may look like the real deal, but it wasn’t, so while he doesn’t let on, Clark Kent has been mortally wounded in the abdomen and after the cops depart, he tries to stagger to some medical help, but collapses into the Midvale River. 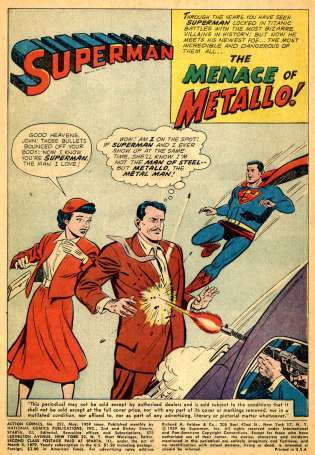 Since Weisinger blew it again, I’ll fill in and remind you readers that Metallo first appeared in another landmark issue of Action Comics, issue #252 [Sage #32] from May of 1959 where “The Menace of Metallo!” was actually the lead story, and was the co-creation of my friend, Al Plastino, but the issue is better known as the first appearance of the Supergirl we know and love, also co-created by the great Al Plastino. So, Clark’s idea is to have the surgeon from Atlantis recreate the Metallo configuration on his body, since Atlantis has a stockpile of green kryptonite on hand. Geez, who doesn’t have a supply of the stuff? So, the doctor agrees and soon Clark Kent, Metallo is paying a visit to the palace of King Superman. At first, he reveals that he’s wearing a bomb vest and King Superman is reluctant to do anything as he fears that if Clark Kent is destroyed, it could affect him as well. 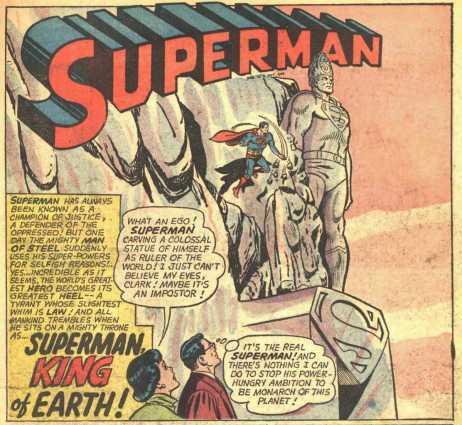 After Kent tosses the vest at the marble statue of King Superman, destroying it, he reveals his real weapon by opening the panel to his chest and exposing King Superman to green kryptonite. He reasons that he is willing to risk dying if it will neutralize the threat of a super despot. The weakened King Superman pleads with Clark and explains that his evil persona was all a ruse. Once the red K caused the split between Clark and Superman, his super hearing picked up a high frequency mechanical voice from planet BXPA. It seems the transmission was a set of orders to a robot pilot of an invisible missile from BXPA, instructing it to blackmail the planet by demonstrating the ability to freeze, cause earthquakes and ultimately destroy it. This was the threat Superman originally detected, but couldn’t see because of the distraction of the red K meteor shower. Superman continues to describe the world-wide panic if the inhabitants of the Earth had known of this threat from deep space, so he took on the guise of an evil emperor, after secretly huddling with the leaders of the world to alert them and then appeared to be causing the phenomena that the ship was producing until he could devise a plan to neutralize the threat from BXPA. After a clandestine reconnaissance of BXPA, he learned it was a dead planet, probably destroyed by one of its own weapons and that the ship was on auto-pilot being guided by old, automated instructions. Star Trek’s “Doomsday Machine”, anyone? Our hero also discovered that the missile only becomes visible for a brief time when it enters the atmosphere of the planet it is about to destroy. But now it appears to be too late. Clark quickly closes up his chest panel and miraculously the effects of the Red Kryptonite evaporate and the two beings are reunited while the metal body of Metallo is sloughed off. Bursting through the dome of his palace, Superman is able to see the other-worldly weapon just before impact and successfully deflects it back to BXPA to destroy what’s left of the dead world. The final two panels show Superman revealing the truth to the assembled United Nations and the story ends on a happy note. I wouldn’t call this the ultimate Silver Age Superman tale, but it had a lot to offer with some plot twists and so many of those old, familiar and much-loved elements, such as the unpredictability of Red Kryptonite, which was the bulwark of the story itself, a threat of destruction from space, the Fortress of Solitude, Superman robots, a brief shot of Kandor, Lois, Jimmy and Perry, Lori Lemaris, more elements of the rainbow of kryptonite and the terrifying prospect of a Superman gone bad, not to mention a creative way to harken back to the “Menace of Metallo!” I think I’ll grade this one an 8 on the 10-point scale for some solid story-telling. 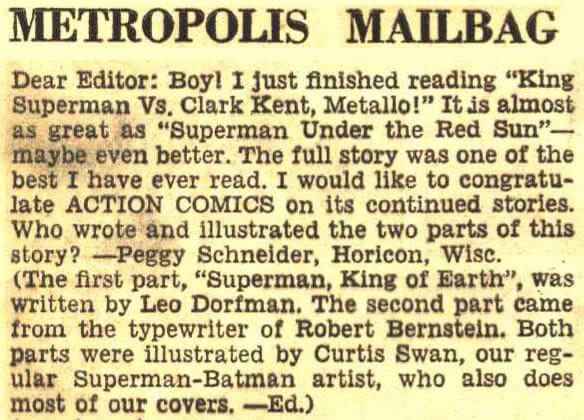 I find it interesting that they changed writers in mid-stream (as revealed in Action Comics #316's Metropolis Mailbag) and off the bat, the name Robert Bernstein is unfamiliar to me. Maybe I need to do some research and satisfy my curiosity. In the past, it’s led to some wonderful outcomes. Whether you’ve enjoyed him in the pages of Action Comics, Superman, World’s Finest, Justice League of America, or any of the other places he pops up all across the DC Universe; not forgetting the small screen in the classic Max Fleischer cartoons and other superb animated offerings over the years or perhaps the George Reeves television series, the radio show, the big screen adaptations or nearly any place else you could name, the cultural impact of Superman is undeniable. Hats off now and forever to Jerry Siegel and Joe Shuster for bringing us the original superhero so long ago in Cleveland, Ohio and changing the world forever. All these eight decades later, Superman is still the man! C’mon back in mid-May for another installment and as usual, you are cordially invited to be a part of the process. If you’ve got a comment, question or story you’d like reviewed, feel free to express yourself at my handy -mail: professor_the@hotmail.com.